It can be difficult to keep a preschooler amused with one activity for a prolonged period of time, but one thing does have the ability to keep even the busiest of preschoolers occupied...PUZZLES!! My children love puzzles, and I love them because they are a great way for preschool-aged children to keep their focus and practice problem solving skills. 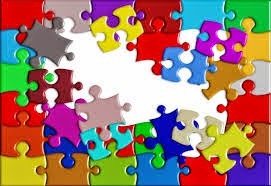 Although it does take some time for a preschooler to get the knack of building a puzzle, with time and practice they can assemble a puzzle like a pro. Mattel makes the jigsaw puzzle, Disney's Pixar the World of Cars. This puzzles contains 24 easy to assemble pieces. It's recommended for children three to seven years of age. This is one of the best jigsaw puzzles for preschoolers because it is based off a movie all preschool aged children love. The puzzle pieces are large and made of thick material so they can withstand the rough use of a preschooler for quite some time. After this puzzle is assembled, it makes a 10 inch by 13 inch replicated image from the hit movie. After your child has mastered the World of Cars puzzle, the next best jigsaw puzzle for preschoolers is the puzzle by Hasbro, Nickelodeon's Sponge Bob Squarepants. This puzzle is sure to maintain a child's interest because it is based off the hit TV show all children love, Sponge Bob Squarepants. Although it is recommended for children five years and older, children around the age of four can easily complete it. It's a 70 piece puzzle that tests a child's ability to problem solve. While it may take some time to complete, the final product of a 10 inch by 13 inch image will have your preschool proud of their accomplishment. In today's world, of course there's a puzzle app for Smartphones. We download the puzzle apps on our phone so we can take them on the go. My youngest children were able to start solving these puzzles around the age of one. It's a fun way to keep them occupied and their mind's active. These are the best jigsaw puzzles for preschoolers that I have found. Not only are puzzles a great method to keep children entertained, but are a great opportunity to spend time with your child as well. Puzzles are perfect for spending a relaxing afternoon building puzzles with your preschooler. After, you and your child have completed a puzzle, you can apply clear contact paper to both sides of the puzzle to create a poster for their room or a place mat for the dinner table.